A view from Kobe’s Tamondori onto Sankaku Koen (literally Triangle Park) in Hyogo-ku. The road on the right is Daikaidori (大開道), the one on the left Yanagiharasen (柳原線). It lead to Hyogo Station, and still does so, today. Behind the photographer’s back is Shinkaichi (新開地), until WWII, Kobe’s main commercial and entertainment center, famous for its many theaters. Though visually unremarkable, this area is actually the birthplace of Kobe. What we now know as Hyogo-ku, was originally the village of Hyogo, which has a long and illustrious history. The Nihon Shoki describes the founding of Ikuta Jinja in this area by Empress Jingu in 201 A.D.
Over the years, an excellent port developed. It was called Owada-no-tomari (大輪田泊) during the Nara (710–794) and Heian (794–1185) periods. Japanese embassies to China used this port as one of their points of departure. In 1180, Taira no Kiyomori moved his grandson Emperor Antoku to nearby Fukuhara, now a red light district within walking distance from the location on the photo. Until the emperor returned to Kyoto five months later, the area effectively was the capital of Japan. Four years later, in 1184, a major battle was fought in this area between the Taira and Minamoto clans. It was one of the final battles of the Genpei War. During the Kamakura Period (1192–1333), trade with China and other countries made the port flourish. It was during this time that it finally became known as Hyogo Port (兵庫津). In 1868, Hyogo Port was officially opened to foreign trade. Along with Yokohama (1859), Nagasaki (1859), Hakodate (1859) and Niigata (1869), it was one of the first open ports of Japan. The foreign settlers however, choose to build their concession across the Minato River, in the village of Kobe. 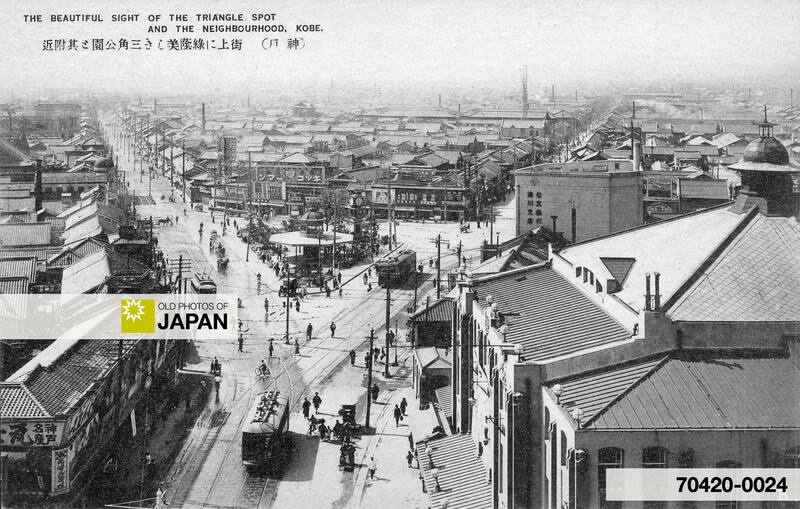 On April 1, 1889, Hyogo and Kobe became one when the city of Kobe was founded. Things have changed quite a bit since the days of this postcard. Daikaidori doesn’t have a streetcar route on this photo, but today it is a crowded thoroughfare. Yanagiharasen, however, has become more like a side-street. Sankaku Koen still is an important public transportation hub. Underground lies Shinkaichi station where the Tozai Line of Kobe Rapid Transit Railway intersects with the Namboku Line. 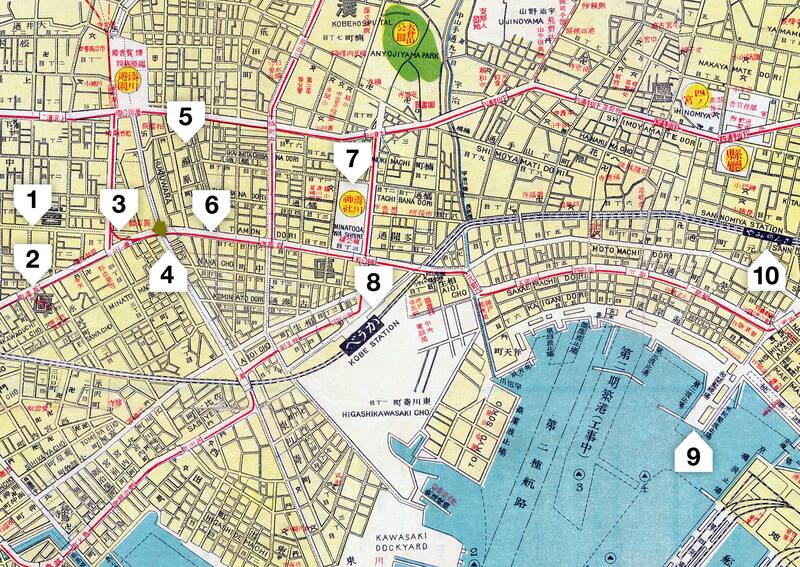 1937 (Showa 12) Map of Kobe: 1. Daikaidori; 2. Yanagiharasen; 3. Sankaku Koen; 4. Shinkaichi; 5. Fukuhara; 6. Tamondori. You can also licence this image online: 70420-0024 @ MeijiShowa.com.